By MCEF in Info, News on November 8, 2016 . 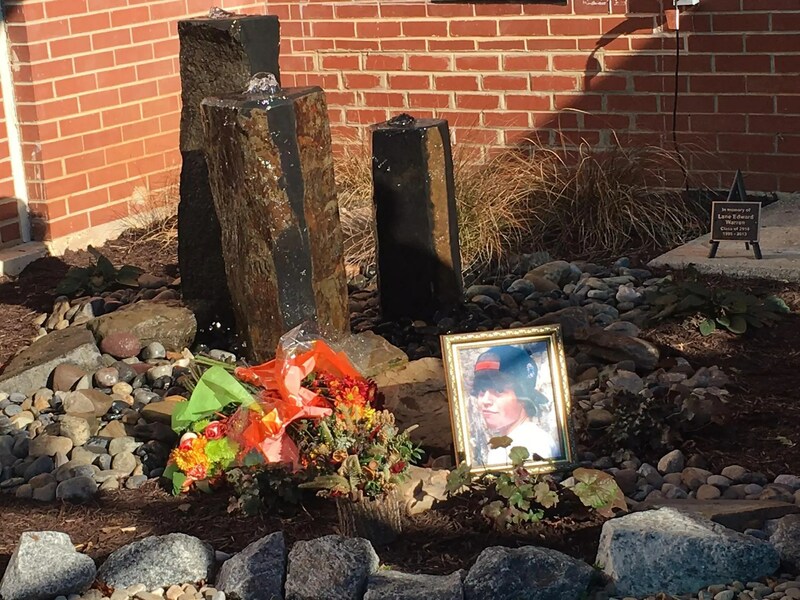 Members of the Madison County community gathered on Saturday, November 5, 2016 on a beautiful fall day to dedicate the new Courtyard at the High School and to celebrate the life of Lane Warren with a fountain in his honor. Over this past summer, Mr. Gary Wintersgill, principal of Madison County High School was determined to renovate the senior courtyard, which had been neglected for many years. Through the cooperative efforts of dedicated personnel at the school, in the Madison County Public Schools administration, the School Board, and community businesses, such as Greenscapes Nursery and Garden Shoppe and Plow & Hearth, the senior courtyard was transformed. “This space is not only for seniors to use for lunch but serves as an outdoor classroom and extension of the library for all students,” said Wintersgill. Lane was a senior at Madison County High School when he died after a tragic car accident in October, 2013. His family set up the Lane E. Warren (LEW) Memorial Fund through the Madison County Education Foundation (MCEF), for gifts honoring Lane. Mr. Wintersgill spoke briefly about the how this project came together and thanked the organizations and staff who made possible the courtyard renovation and fountain installation. He presented the plaque that will go on the wall behind the fountain indicating its dedication in memory of Lane Warren.